The Wemos D1 mini pro includes a CH340 USB to UART IC to allow it to be programmed directly from the USB port of a computer. Drivers are available in the link below. Simply download and unzip them, connect your D32 to your computer via a USB cable, and when the new hardware is detected, point the wizard to the folder you just unzipped to and it should install without any problems. 4) In the window that opens up look for the entry titled 'esp32 by Espressif Systems version x.x.x' and click on it. 5) In the bottom right-hand corner of this entry you should now see an install button appear. Click on this and board manager will then automatically add all the files necessary to support the ESP32. This may take a few minutes depending on the speed of your internet connection. 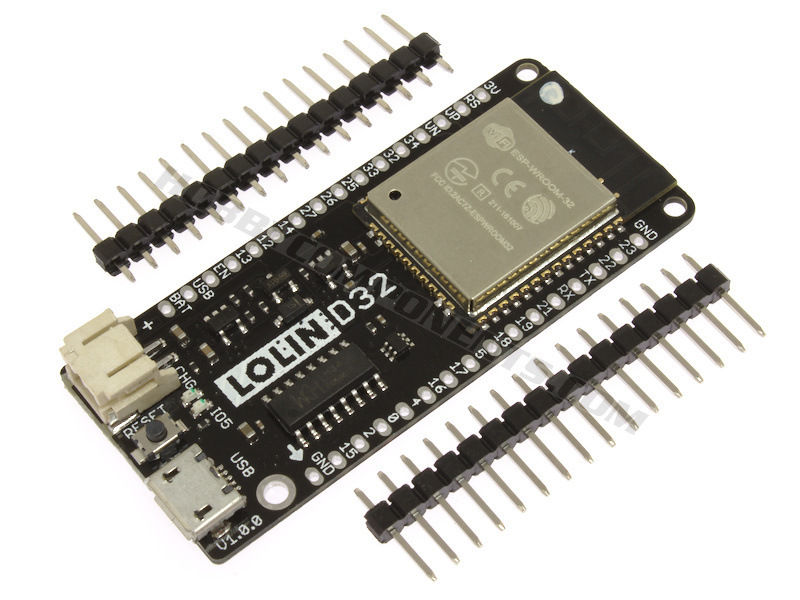 6) Now under Tools->Board you will see a set of new additional esp32 based board types including one labeled 'LOLIN D32'. Disclaimer: Libraries, example code, and diagrams are provided as an additional free service by Hobby Components and are not sold as part of this product. We do not provide any guarantees or warranties as to their accuracy or fitness for purpose. Diagrams are for illustration purposes only and may not be to scale. Copyright notice: Descriptions and diagrams on this page are copyright Hobby Components Ltd and may not be reproduced without permission. 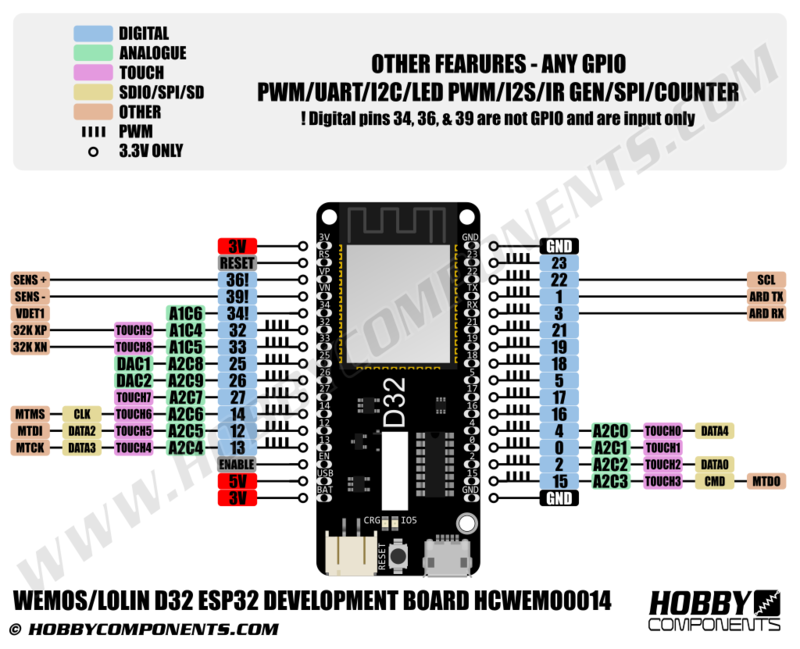 From the datasheets and info online, I gather that any pin can essentially be used for any purpose; in other words I can choose which pins to use for uart/spi/i2c, etc. Is this applicable to this board as well? Also, how do you access the temperature sensor? It's my understanding that this is the case with the caveat that a few of the GPIO cells (34-39) are input only and so can only be connected to input pins of a peripheral. How can I configure Bluetooth to work with a cell phone? I bought a couple of Lolin D32 boards from you a while ago and cannot get them to work with Arduino 1.8.9 IDE, when I try to update the Board Manager in the IDE I get error downloading https://dl.espressif.com/dl/package_esp32_index.json message. I've just tried the link with 1.8.9 and it seems to working fine for me. Could you give it another try, maybe the host was down at the time? The link you're getting the error for isn't the espessif one so there won't be any information for the D32 in that one. In your Arduino IDE could you go to File->preferences and in the window that opens up you'll see towards the bottom a text box labelled 'Additional Boards Manager URLs' which will be the place where you pasted the original espressif link. On the right-hand side of that text box you'll see a window expansion button. Click that and another window will open up showing any links you've pasted into that box. Can you check that the link you've pasted in there looks exactly like the one I've highlighted my window shown below. Also, if you have more than one link pasted can you make sure they are all on separate lines like it is in mine.